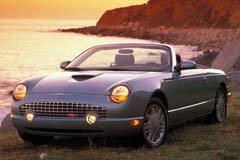 Buying a used Ford Thunderbird today is to delve into the past of an iconic vehicle. First introduced in 1955 as a two seat sports and luxury car, the “T-Bird” immediately took its place in auto making history. That 1955 version was stylish, while offering a smooth, soft ride and V8 power. It was simply constructed by Ford at a sensible cost. Ford exhibited a concept car in 1999 that brought back memories of the mid-fifties model that was met with great enthusiasm. That led to the retro edition Thunderbird that began production in 2002. This style "Bird" would be available until 2005. These provided excellent steering and handling with independent suspension. They were powered by a 3.9 liter V8 paired with a 5 speed automatic transmission. The inaugural model year the horsepower was 252 but increased to 280 in 2003. There were minor trim and paint revisions each year, topped off by the 50th anniversary offering in 2005. The retro T-Bird is for those looking to leisurely cruise the streets and highways while garnering a fair share of attention in the process. It also may be a classic in the making. The last of the larger sized used Thunderbirds met their demise in 1999 along with a waning interest in personal luxury coupes. Some of these Turbo Coupes and Super Coupes may still be available in limited supplies.